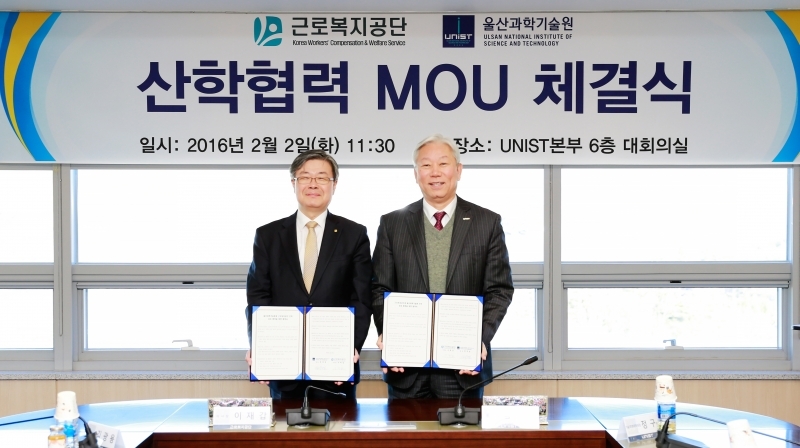 President Jae Kap Lee of COMWEL (left) and UNIST President Mooyoung Jung (right) are posing for a portrait at the signing ceremony for cooperation MOU. Work together to build a more equitable and more sustainable social security system. Earlier today, UNIST signed a Memorandum of Understanding (MOU) with Korea Workers’ Compensation & Welfare Service (COMWEL) to pledge mutual support for one another in the establishment of a fairer and more sustainable Social Security system. The ceremony was attended by UNIST President Mooyoung Jung, Dr. Kooyul Jung (Dean, UNIST Graduate School of Technology Management), President Sungchul Bae (UNIST Academy-Industry Research Corporation), Prof. Changyong Lee (UNIST School of Business Administration), President Jae Kap Lee of COMWEL, Director GwangYong Kim (Insurance Finance Bureau, COMWEL), Manager DongHyun Shin (General Affairs Dept./Insurance Finance Bureau), and Manager MyungJa Jung (Labor&Management Collaboration Dept./Insurance Finance Bureau). 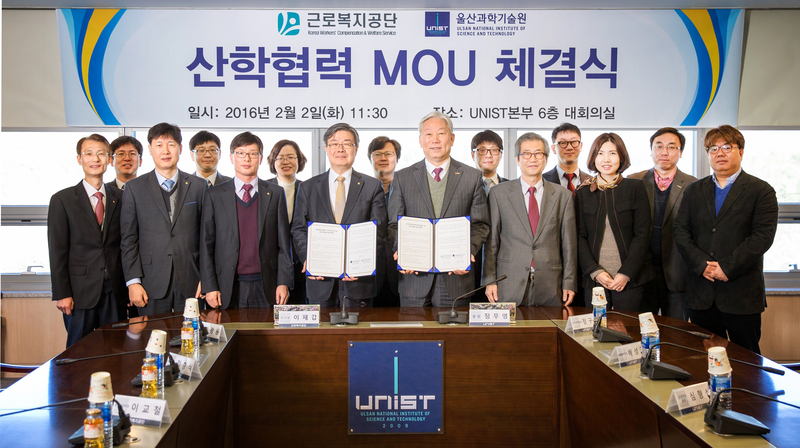 The primary purpose of this agreement is to resolve welfare blind spots in social insurance systems with the help of UNIST’s Big Data Analytics technology. Using the power of big data, both organizations plan on developing employment services to promote the welfare of the job seekers by helping them find employment opportunities. In the memorandum of understanding, the two organizations also promised to expand cooperation in various areas, including medical rehabilitation services, employee assistance services, as well as industial accident compensation services.